In the 1970s and 1980s, there were all sorts of excellent mini figures released as premiums with food in Spain and Portugal. One of my favorites is the Matutano Monstruos set which I previously covered here. I recently completed another of these sets, and it's an amazing one that I'm incredibly excited about--Masters of the Universe! You can even fit He-Man & Skeletor on top of their beasts! These figures were released in the mid-'80s, when MOTU was initially popular, and as far as I've been able to find out were available in the aforementioned countries as prizes with snack cakes (don't you wish you could find MOTU minis packed in with your snack cakes these days?). They are always associated with the names "Panrico" and "Dunkin." From a Google search, it seems Panrico is a major, long-running Spanish company that produces bread, donuts and other pastries. I'm not quite sure how Dunkin factors in. The figures are smaller than typical mini figures like MUSCLE or Monster in My Pocket, but very nicely detailed for their size. They are made of a light, hard plastic and come in many different colors. As shown above, the colors I'm aware of are red, yellow, flesh, orange, dark green, light green, dark blue, and light blue. I'm not sure if there are any others. A full set consists of 20 different sculpts. 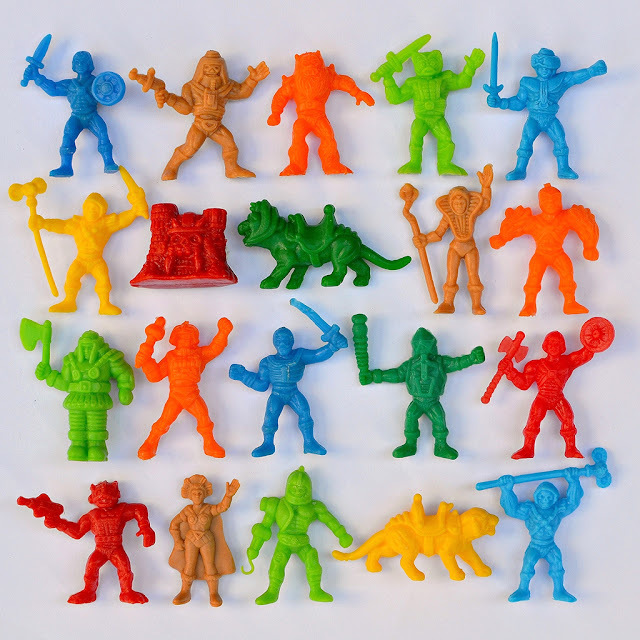 The lineup includes two different sculpts each of He-Man and Skeletor, as well as Man-e-Faces, Beast Man, Mer-Man, Tri-Klops, Castle Grayskull, Battle Cat, Teela, Stratos, Ram-Man, Man-at-Arms, Fisto, Mekaneck, Zodac, Evil-Lyn, Trap Jaw, and Panthor. Here's a bunch of the good guys. How fan-frickin'-tastic is that little Castle Grayskull? I think it's actually my favorite figure of the set. And now some of the baddies. 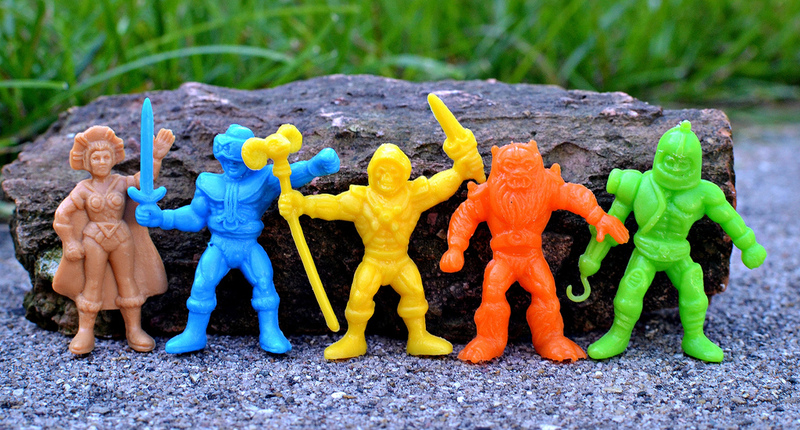 I really dig Beast Man and Trap Jaw and was happy to get them in these particular colors. This photo shows how the Dunkin figures compare to other MOTU minis, including the newly-released MOTUSCLE figures from Super7 and the '80s vending machine bootlegs, with each set's take on Mer-Man serving as the models. 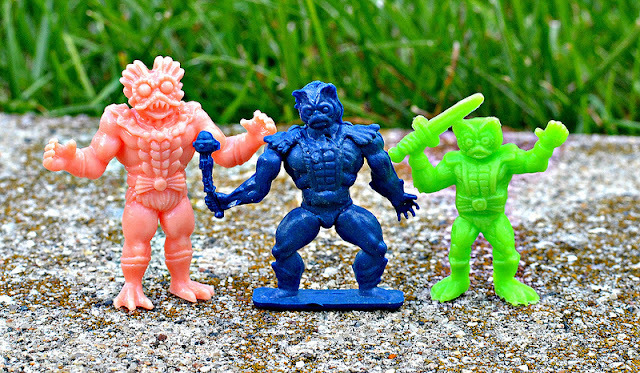 How great is it that at least three different Mer-Man mini figures exist in the world? And there we have the Panrico Dunkin MOTU minis. I was thrilled to not only find out that these were made, but to also be able to track down a set. I love 'em. Great post. 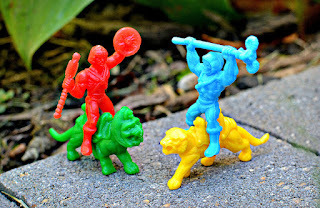 I have never seen a complete set of the MOTU figures. There is also a Thundercats set. I like the sculps and poses, but i wish they were a little bigger. Thanks Shaun. Yeah, they're a bit on the small side, but still great. I saw some pics of the Thundercats ones but don't own any. Wow, great pictures, some of them I never seen in that colors. I got about 100 of them in lots of colors, but not yet completed the collection, if you want I could send you a picture. I live in Barcelona and I collect them since I was 5. 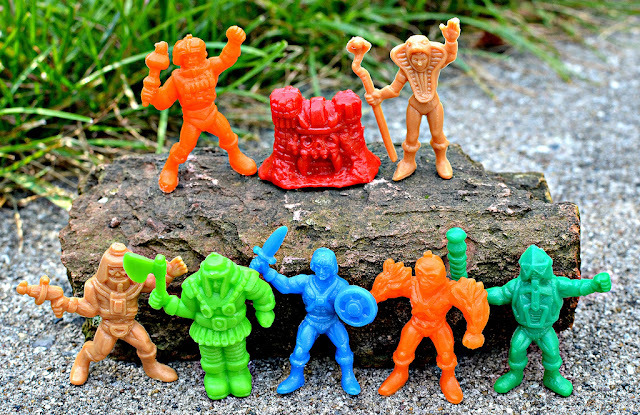 They appear in year 85 as presents in little chocolate cakes for kids called Masters del Universo. Panrico was a popular bread company and they always had some chocolate cake from some TV show giving figurines (Droids, Ewoks, A Team, Thundercats, Sankuokay) or stickers (practically they only did Dragon Ball cakes since early to late 90s, when figurines disappear, it's said that several parents protested because it could be dangerous if the kid swalow it). They have nothing to do with Dunkin, Dunkin was 60's bubblegum name that also give minifigurines (Bugs bunny, hanna barbera). My mother had lots of them. They were the first in make little figures, so it's usual to see that name on internet attached to any kind of little one color spanish figure. I'm gonna buy that motuscles. But those 80's vending machines looks great. Were can I find it if still the chance? Thanks for your comment! I'd love to see a photo of your collection. I appreciate you sharing that info. I did wonder how they got away with putting these tiny figures in with cakes considering the safety hazard. It's also good to finally get more information about Dunkin. The '80s vending machine figures appear on eBay USA every so often. They made clear ones and solid ones in multiple colors. Hi Mike, I will likely want to keep mine because I worked to put together a set with a mix of colors that I wanted. But feel free to let me know which ones you are looking for and which ones you have to trade. I do have some extras, but they are different colors than the ones shown in this post. Excellent cheers mate, I wrote you a message on Facebook as I didn't want to post my email address!